I lecture and teach all over the country. For more information about my availability and fees, please email me at carol@carolannwaugh.com or call me at 303-408-7813. ​From a career in business consulting to full time studio fiber artist and owner of a contemporary art gallery, Carol will talk about her journey and share some lessons learned from moving from a left brain to right brain life. Her sense of humor will have the audience laughing as they relate to every aspect of her journey. Carol is a very popular lecturer at local and national quilting venues. It’s hard to plan this far in advance but so many of our participants have asked us “When is the next workshop?”. So we wanted to commit a couple of weekends next year to teach our next Mixed Media Adventures workshop so we wouldn’t commit to teaching elsewhere! We are excited about continuing our exploration into book/journal making and have several ideas for next year that will probably incorporate image transfer, slow stitching, making our own art tools, and pop-ups. But who knows! We will be working during 2019 to come up with a fun, exciting workshop for you by trying new ideas, new techniques, and of course, some new jokes. A soon as we have more information about the content of our next workshop, we will post here as well as talk about it in our monthly newsletters. If you have enjoyed attending in the past, just save the dates so you can join us next year! 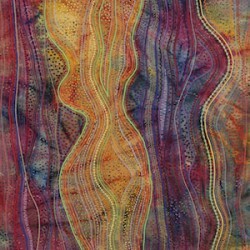 In this workshop, you will be combining couching, hand embroidery and decorative machine stitching to help you create fabulous textures and colors on batik cotton fabric. This is the class you need to explore and use all those hundreds of "decorative stitches" included in your sewing machine. You will also learn a new way to finish the edges of your piece with rattail cord and learn the secrets of mounting your art so it will hang on your wall beautifully. You will leave this class with a finished masterpiece! This workshop will teach you the unlimited design possibilities of raw edge cut work. Starting with simple machine stitching (either free motion or regular stitching) you will stitch a design on the back of your layered fabrics. Then, it’s ripping and tearing (the most fun part!) to uncover a geometric pattern on the top. The final steps will be to hand stitch and machine couch to create your textured fabric art. This is another fun class where every design decision you make is based on the decision you made before.